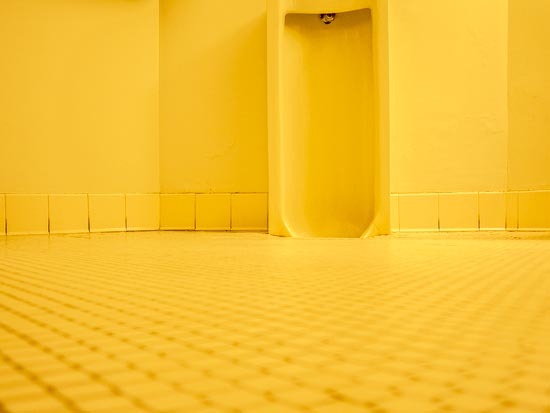 One summer more than ten years ago, when I taught at Princeton, a large spider appeared in the urinal of the men’s room in 1879 Hall, a building that houses the Philosophy Department. When the urinal wasn’t in use, he would perch out on the metal drain at its base, and when it was, he would try to scramble out of the way, sometimes managing to climb an inch or two up the porcelain wall at a point that wasn’t too wet. But sometimes he was caught, tumbled and drenched by the flushing torrent. He didn’t seem to like it, and always got out of the way if he could. But it was a floor-length urinal with a sunken base and a smooth overhanging lip: he was below floor level and couldn’t get out. Gradually our encounters began to oppress me. Of course it might be his natural habitat, but because he was trapped by the smooth porcelain overhang, there was no way for him to get out even if he wanted to, and no way to tell whether he wanted to. None of the other regulars did anything to alter the situation, but as the months wore on and fall turned to winter I arrived with much uncertainty and hesitation at the decision to liberate him. I reflected that if he didn’t like it on the outside or didn’t find enough to eat, he could easily get back. So one day toward the end of the term I took a paper towel from the wall dispenser and extended it to him. His legs grasped the end of the towel and I lifted him out and deposited him on the tile floor. He just sat there, not moving a muscle. I nudged him slightly with the towel, but nothing happened. I pushed him an inch or two along the tiles, right next to the urinal, but he still didn’t respond. He seemed to be paralyzed. I felt uneasy but thought that if he didn’t want to stay on the tiles when he came to, a few steps would put him back. Meanwhile he was close to the wall and not in danger of being trodden on. I left, but when I came back two hours later he hadn’t moved. The next day I found him in the same place, his legs shriveled in that way characteristic of dead spiders. His corpse stayed for a week, until they finally swept the floor. Getting the image required some teamwork. If I get permission, perhaps I’ll post a little ‘making of’ one of these days. Previous PostPrevious Herr Schreck, By Mara L.